Man in the Mirror | Arts and Culture | Style Weekly - Richmond, VA local news, arts, and events. Mike Birbiglia has a little problem. It isn't his comedy career. That's just fine. He wrote a bestselling book, "Sleepwalk With Me: And Other Painfully True Stories" that was a finalist for the prestigious Thurber Prize for American Humor. He's performed several award-winning off-Broadway solo shows, regularly appears on National Public Radio's "This American Life" and "The Bob and Tom Show," and directed and starred in a recent Sundance award-winning film based on his book. Throw in a cameo on the hit HBO show "Girls" for good measure. No, his problem is that he suffers from a sleep disorder that means he must stay on the first floors of hotels. He once ran out of a second-story window in Walla Walla, Wash. He freaks out his wife at night, occasionally. But few comedians are better at juicing uncomfortable memories. Sample observations about growing up in Shrewsbury, Mass. : "High school is not unlike a Mormon fundamentalist cult where the women are claimed by the older and more powerful." "Making out is sloppy: It's like a dog eating spaghetti." "I was really good at playing basketball alone: baskurbation." Taking a break from working on a screen adaptation of his Drama Desk-nominated solo show, "My Girlfriend's Boyfriend," which he'll perform in Richmond, Birbiglia talked with Style Weekly via email. Style: Do you consider yourself more a performer or writer? Were you the guy who was immediately funny in the room, or more analytical-funny? Birbiglia: I was never really the class clown growing up. The class clown was always the mean guy who walked into the room and was like: "You're fat. You're gay. I'm outta here!" I was always a little fat and a little gay. I'm definitely someone who started as a writer and developed into a performer. What was the first thing you realized was funny about you from audiences? I have this joke in my show right now, which is like, "I don't even really look in the mirror anymore because I get angry. And then I feel like I'm complaining about a bad call a ref just made. I'm like, 'C'MON!!! You're blind if you're leaving the house like that!' And the ref is God and the competing teams are my gut and my receding hairline and it's a close game, because my gut is large and my hairline is fast." That joke was an idea that I just came up with, and when I tried it on stage and the audience laughed I was like: "Oh, I guess that is true. That is how people see me." Would you compare the process of finding your voice on stage to group therapy? I don't think it's like therapy in the sense that a good comedian or a good playwright is writing a piece that is ultimately about the audience and not about themselves, so that the audience can find themselves in the writing and take something away personally. As an inexperienced actor, was it intimidating to work alongside someone with the acting chops of Lauren Ambrose (Claire from "Six Feet Under")? Lauren was great. Actually casting Lauren [in "Sleepwalk With Me"] was my wife Jenny's idea because we wanted to make sure that the actress playing Abby was funny and strong and powerful so that at the end, when they break up, you don't feel bad for her — you don't feel bad for either of them because they're both going to be fine. Lauren really exudes that naturally. So how is your condition now? What are your odds of recovery? Well, what I have has no cure, so what I can do is just kind of deal with it every day. And my wife and I definitely take that into consideration with our life choices and where we live and our schedules. But every now and then I still sleepwalk. Like for instance, recently during the filming of "Sleepwalk With Me," I actually had this dream one night that I was directing myself while sleeping. And so my wife came into our bedroom and I was adjusting lamps. I'm not making this up. I was adjusting lamps in our bedroom. And she said, "What are you doing?" And I said, "We're shooting." And she said, "No, Mike, we're not shooting." And I said, "I'm sorry, but we are." What's the whole ride with the film "Sleepwalk With Me" been like? It's been incredible. It's a small film, but through the power of Twitter and "This American Life" has reached a much wider audience than you'd expect a film like this to reach. So it's been pretty overwhelming. What was the hardest thing about directing yourself? Well, the hardest thing is just time-wise. It takes a lot of times to watch playback on scenes while you're shooting them and to be calm enough and have enough perspective about how it fits into the larger story. Fortunately I had a co-director, Seth Barrish, who directed both of my one-man shows, and so we have a shorthand from working together for so many years so that worked to our advantage. Most of your material is worked out onstage. How much revision would you say goes into your most successful work? Honestly, years of revision. Like I would say "Sleepwalk With Me" was revised over four to six years, "My Girlfriend's Boyfriend" was about two to four years. It's a lot of trial and error. What comedians took you under their wing? I actually used to pick the brains of a lot of comedians who would come to the D.C. Improv who I would open for, like Brian Regan, Jake Johannsen, Dennis Regan, Kathleen Madigan and Margaret Cho. And I pretty much asked every comedian I admired questions. The biggest thing that I learned was that before you make fun of someone else, you have to make fun of yourself. How did the cameo on the show "Girls" come about? The way I ended up doing that scene in "Girls" was that I think Lena Dunham just asked me to do it. I think I was doing a bunch of the staged table reads for the show and that was one of the parts I played. And it got a lot of laughs in the table read so after I did it they asked if I wanted to do that in the show, and I said "Sure!" It's funny because when I moved to New York I did a lot of temp work and I was an awful, awful temp. I would fall asleep and constantly be late and was just really irresponsible. So I had to channel a lot more responsible business types who I went to college with. How does your dad like your career choice now and does he take any credit? He's been really supportive. My parents just saw the film last week and they really liked it, which is exciting. They liked it a lot more than my short film "Fresh Air 2: 2 Fresh 2 Furious" (which is on YouTube), because I think they didn't like in that one how I carry a gun. What kind of advice do you give comedians whose personal lives just aren't that funny? 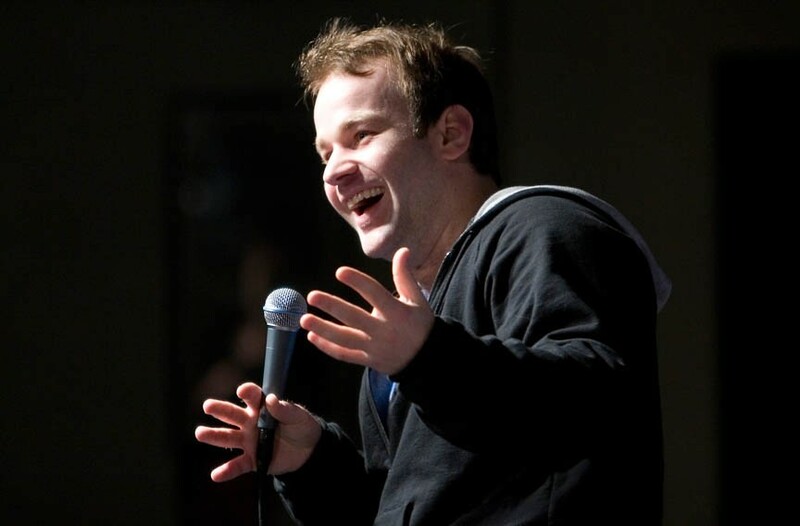 Mike Birbiglia performs "My Girlfriend's Boyfriend" at the Modlin Center for the Arts at the University of Richmond on Friday, Oct. 19, at 7 p.m. $10-$34. His film, "Sleepwalk with Me" will screen at the Modlin Center on Wednesday, Oct. 10, at 7:30 p.m. at Camp Concert Hall. $5-$9. For information go to modlin.richmond.edu.